Bromadiolone, the active ingredient in Just One Bite® II is a second-generation anti-coagulant rodenticide. May consume a lethal dose of bait in just one feeding. Kills roof rats, Norway rats, and house mice. Delays death 4 to 5 days so there’s no bait shyness. For indoor and outdoor rat and house mouse control. 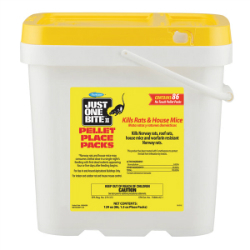 Place packs fit in burrows, runways and hard-to-reach areas where rats and house mice live and breed. Rats & house mice will eat right through the place pack wrapper.